Well...la-de-da!!! Imagine that – an oracular scientist (optics, no less) of 42 years in our midst!!! The charts and maps are beautiful and mean (as Hillary would say) at this point nothing. That 97% fraud was also discredited in both 2009 and now...a purely political gimmick. The climate has not changed in two decades, though a slight warming trend has occurred for reasons not even an optics scientist can decipher, much less an actual climate expert. You're just as much an amateur climate-guy as all the rest of us. My point was that mankind (not just the poor souls damaged by the latest freaks of Nature in California or elsewhere) has not effected or been materially affected by this slight variance, nothing new. My entire childhood was spent in the 1930s, the hottest decade yet and followed by the cold snap of the 70s-80s (when perhaps even the optics-guys prophesied imminent doom through freezing worldwide)...so what else is new? Pockets of people are hurt worldwide by acts of Nature locally, while the other few billion are not. As for sources, I often give them and invite anyone to present DATA disputing them. I don't care if you believe me or not, in other words. Let’s see the 2010’s (so far) are about 0.9C hotter than the 1930’s. In fact every decade since the 1930’s was hotter than the 1930’s. Interesting that the rate of temperature increase in the 30’s was about that of 1970 until now. Perhaps that is what Jim meant (but I doubt it). I'm noting a few sites alarmists should read regarding the 30s in this country as well as how the hottest year (1934) compared to the rest of the Globe, which was actually cooler. The events of the 30s (dust bowls, for instance, displacing millions) compare precisely with the natural disasters in the U.S. of 2017, affecting thousands but not millions. Globally, temps (1934) were actually cooler than those of the U.S. I'm not cutting and pasting (and taking up needless space) charts, maps, etc., assuming that folks have enough sense to click on a source and read it. The climate cooled just as precipitously following the 30s as alarmists rave about the precipitate heating (though insignificant) currently. Nobody could explain that phenomenon then, just as nobody actually has a clue about global anything now, especially climate. Let’s see, the first of your linked articles talks of the 30’s being the hottest ever in the US (1.7% of the globe). Not exactly global. The second one says the 30”s were the hottest ever for summer time in the US only. Not only limited to the US, but to summer months only (your search is what is known as cherry picking). Your third article (from skeptical science) debunks the story of the 30’s being the hottest ever - a very easy job (READ IT). The Global, All-Year averages are given in my plot above. No one is saying the dust bowl across the Plains was not a terrible time, but it was not due to ghg emissions. And your comment in red above, is patently wrong. The cooling “following the 30’s” is about 0.14C (looking at red line - smoothed) and 0.3C (looking at the blue line - yearly averaged) in the plot above. 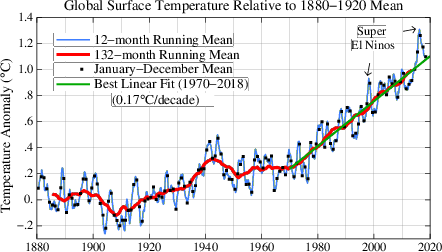 The heating from then until today by the alarmists who "rave about the precipitate (sic) heating (though insignificant)” has been 0.8C (looking at red line - smoothed) and 1.2C (looking at the blue line - yearly averaged). Many scientists do have much more than a “clue" about the causes of global warming - they have data, science and attribution studies. And there is much more DATA, Science and Attribution studies. Would you care to submit DATA proving that ghg was not a factor since industrial activity (those thousands of steam locomotives and other steam-driven machines) was perhaps more invasive then than now, considering all the CO2 regulations that have resulted in penultimate scrubbing of emissions of everything from generating plants and factories down to prohibitive cigarette-smoke in the last 35 years? Diesel eighteen-wheelers don't count but auto-exhausts do. Of course, the over-plowing and farming devastation of the soil mattered but what caused all the wind that blew incessantly to park Ozark soil across the eastern U.S. to the Atlantic...or was it east-to-west, following the traffic? One wonders, too, why the rest of the world was cooler in 1934 than the U.S. Conclusion: Every effort should be made (God gave us brains) to discover everything possible, but currently speculation, conjecture and wild disagreements are about all the DATA-driven folks have to offer concerning climate. The collecting and publishing of DATA is a simple matter, but the interpretation/analysis of it is not, as evidenced by the “experts.” Remember all the pre-election polls (DATA) of 2016 that the "experts" claimed as proof that Trump would lose? Have a nice meal of crow. Read statement in red above. I certainly do think that ghg emissions have been a factor - increasingly since the industrial revolution. But anyway here is some DATA. No ghg emissions (via steam engines) were not greater in the 30’s than today. Jim wrote: Remember all the pre-election polls (DATA) of 2016 that the "experts" claimed as proof that Trump would lose? Have a nice meal of crow. The eletion polling data only measures potential voter turnout, and estimates vote totals. Most claim a 5% margin of error. Trump, in fact, did lose in the way that polls measure loss, vote totals. Losing the electoral college while beating your opponent by three million votes is unprecedented, and would have been impossible to predict. Ironically, the only poll that got it wrong was the conservatively biased one. Looks like Jim has had crow several times in this thread, just about every time he posts. You prove my point precisely. You present a nice little chart but you don't explain which element caused the other, if at all, or vice versa. The chart proves nothing, in other words, except a statistical record, which a sharp sixth-grader could have produced just examining measurement implements. You are hopeless. An unending stream of unrelated questions. The answers given are not even acknowledged. Good Bye. The Hawaiian false alarm is far more interesting. To Jim, KeithE wrote: 1You are hopeless. 2An unending stream of unrelated questions. 3The answers given are not even acknowledged. KeithE wrote: You are hopeless. An unending stream of unrelated questions. The answers given are not even acknowledged. Ah yes...my wife tells me the same thing occasionally. That hurts, of course, because she's intelligent. And you furnish no acknowledgment (beneath your exalted level of Climate-optics expertise) because you can think of none. You didn't mention how each of the elements in that little chart affect each other, if at all, nor did you furnish further charts (surely there many) that explain how other elements such as ocean-collection/driven CO2, sea-ice-components, the mega-million tons of stuff emitted in China and India (if appropriate—probably not but far more than the paltry-by-comparison volume from the U.S.), current configuration of sunspots, the idiocy of the exalted 97% Ph.Ds, or all the cigarette smoke and animal ghg affect the total picture. As for Hawaii, the governor said a government-employee hit the wrong governmental button, and probably expected everyone to believe that. Of course, that could have happened if the employee was drunk but one mustn't mention that because it might offend Hawaiians—that racist thing, doncha know. Comparing sources, Keith posts facts with substantiation. You and Jim post stuff from paid right wing propaganda sources. Your stuff isn't even good for a laugh. To David, Sandy wrote: Comparing sources, Keith posts facts with substantiation. 1You and Jim post stuff from paid right wing propaganda sources. 2Your stuff isn't even good for a laugh. 1) ... "paid right wing propaganda sources?!"